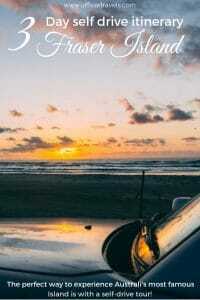 A 3 day Fraser Island Itinerary | All the must see places and more! When we decided to do a self-drive tour of Fraser Island, we were unprepared for its natural beauty. Sure we’d heard about its lush white sands and its beach that stretches for miles and miles, but actually being there seeing it for ourselves, that was a whole different story. 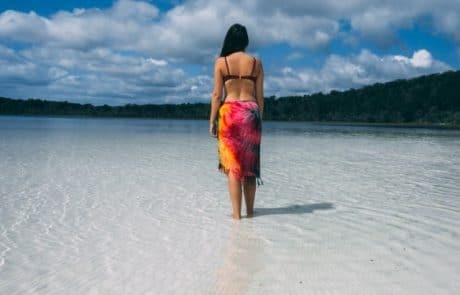 We’re glad we chose to do a DIY tour as it gave us the freedom to explore it in our own time without feeling rushed or herded by other people and we think 3 days on Fraser Island is the perfect amount of time to see the highlights. 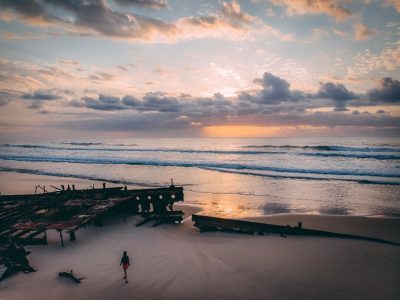 So if you’re unsure on what to do on Fraser Island once you get there, here’s our itinerary to help you plan the perfect trip, we’ve even included a Fraser Island map! 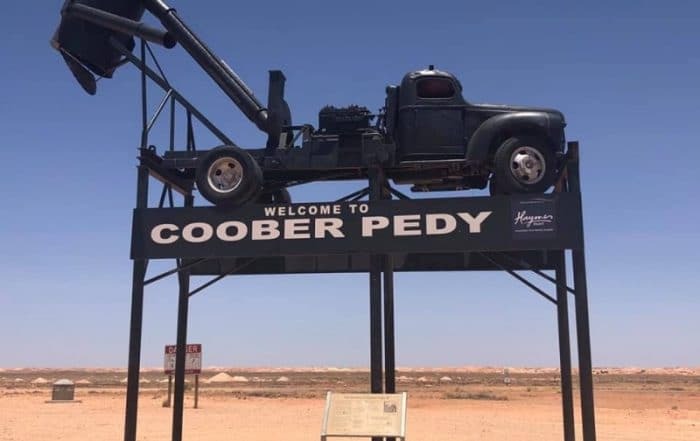 If you’re travelling as a couple or part of a group and you’re wanting to save some dollars, you’ll want to check out a self-drive tour! For a guided tour for three days you’ll be looking to spend around $435* per person, but for a self-drive tour of the same length, it’s around £370** per car… this price includes all your permits except camping, so if there’s four of you it’ll be around $90 each, plus your camping permits which are $6.55 each per night. We’ve written a more in-depth post about how to hire a 4WD for a self drive tour of Fraser Island if you’re still unsure. It’s wise to start the day early for your first day on Fraser Island so you can beat the morning high tide. 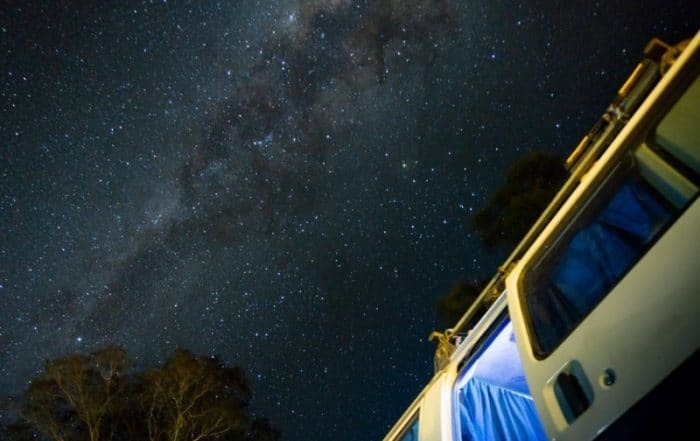 We recommend camping at Inskip Point the night before so you can be up early and ready for the first ferry over to Fraser Island, which is at 6 am. Surprisingly, we were the first ones on the day we went so it was a fairly quick turn around for us but expect a little bit of a wait if you get there later. The ferry to Fraser Island from Rainbow Beach takes about 15 minutes. This gave us plenty of time to have a walk around the deck, take some photos and watch the sunrise. One important thing you need to know before you head over to Fraser Island is the tide times. This will alter the times that you can be on the beach road slightly. Your 4WD rental company should be able to provide you with an up to date list of Fraser Island tide times for your stay there. Once you’re on Fraser Island you have two options. Take the inland route or stay on the beach and drive around North Spit; this will depend a lot on what the tide is doing when you arrive; North Spit isn’t manageable near high tide. Your first stop will be inland, so head to access point at Dilli Village via the Main Beach. 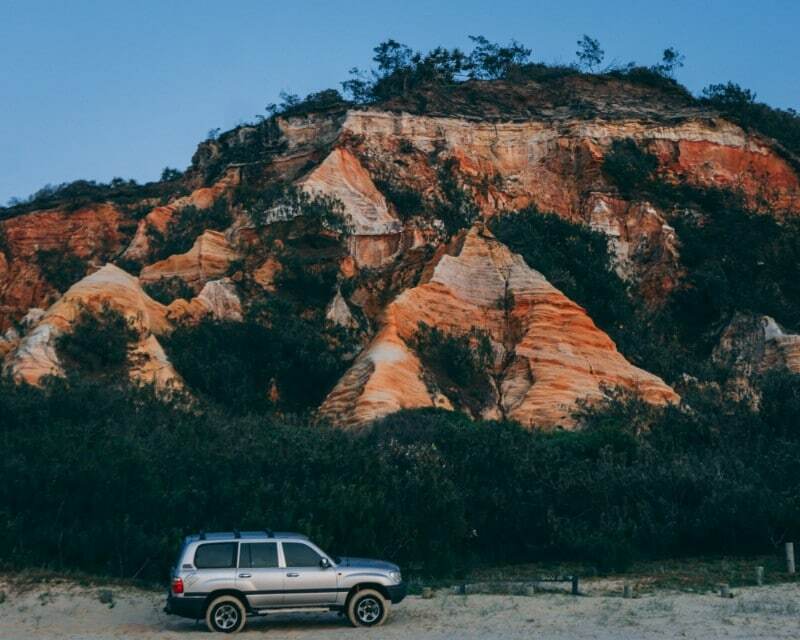 While the tide is in throughout the morning, it’s the perfect time to tick off the first section of the Fraser Island self drive itinerary; explore the perched. 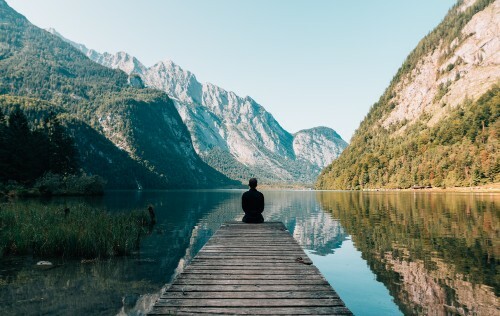 Perched lakes are ones that form above sea level and are filled with 100% fresh rainwater. Fraser Island has a lot of these within its rainforest sand dunes and each one is beautiful in its own way. Due to the low nutrients in the water, each lake can maintain a varying amount of life but all are pretty safe to swim in. The only access point for the Fraser Island perched lakes is through Dilli Village; the Eurong route is a one-way exit. It’s a short drive from Dilli Village to the first lake but the tide is in until midday so make the most of the off road tracks and scenery! 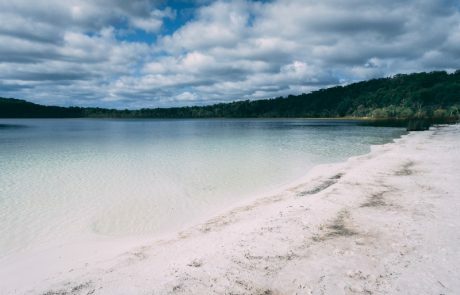 Lake Boomanjin is the first of 3 lakes on the Fraser Island self drive itinerary and in so many ways, it’s the most unique. It’s the biggest perched lake in the world, within one of the worlds oldest tropical rain forests… on the worlds largest sand Island. When I found that out, it just blew my mind. What’s even more impressive though, if that’s possible, is its magical colour. 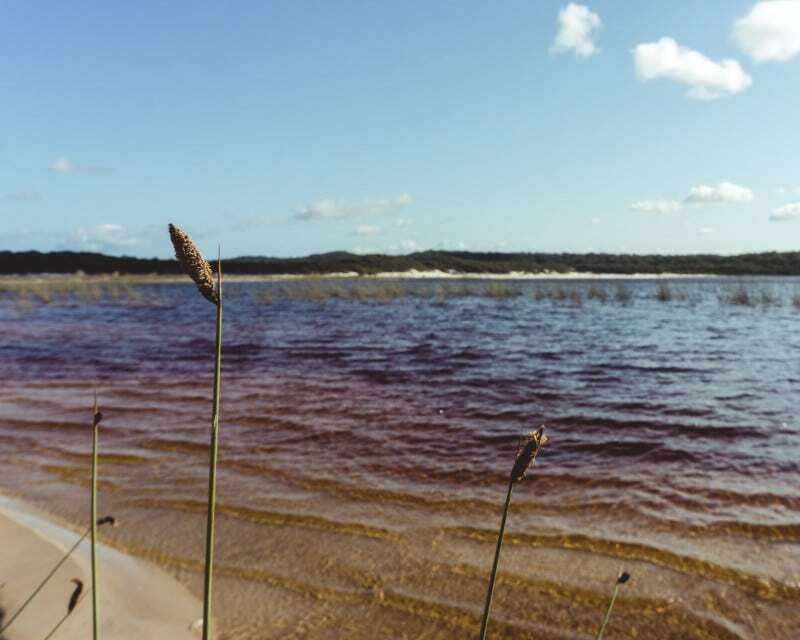 You’ll have seen p photos of the crystal clear waters and white sands that can be found on Fraser Island, well, they aren’t of Lake Boomanjin. Nope, this lake is a breathtaking rainbow of reds and oranges thanks to the nearby Tea Trees that have stained the water with their tannin that leaks into it. Sure, it doesn’t look appealing to swim in but it’s at the top of our list of must-see things on Fraser Island and you’d be mad to miss it. Grab your swimmers and your suncream because you’re about to step foot into paradise. Lake Birrabean is where you’ll find the picture-perfect paradise seen on all the brochures, with its turquoise blue perfectly clear waters and powdery white sand you’ll never want to leave here. You know what’s even better? The tour buses bypass Lake Birrabean and head straight for Lake Mckenzie so we can almost guarantee this beach will be empty. We spent a good portion of the morning here. Ok, so it’s this lake that’s actually on the brochures but they must photoshop the crowds out because this lake was busy. Despite the crowds, it’s still a really pretty lake but way too touristy to enjoy fully. With its massive car park, paved path to the beach and built up toilet block it wasn’t hard to imagine you were back at Bondi Beach. 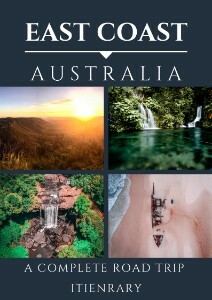 So why is it on our Fraser Island itinerary you ask? Well, we might not have enjoyed it as much as Lake Birrabean but you can’t come to Fraser Island and not see it. Plus, you might enjoy it a lot more than we did! That should bring you up until midday so it’s time to head back to 75-mile beach. To get back onto sand you’ll have to loop around Lake Mckenzie and through Central Station, heading for Eurong. The track gets pretty interesting in places so watch for oncoming traffic; once you get towards Eurong it’s all one way because of how narrow the tracks are. 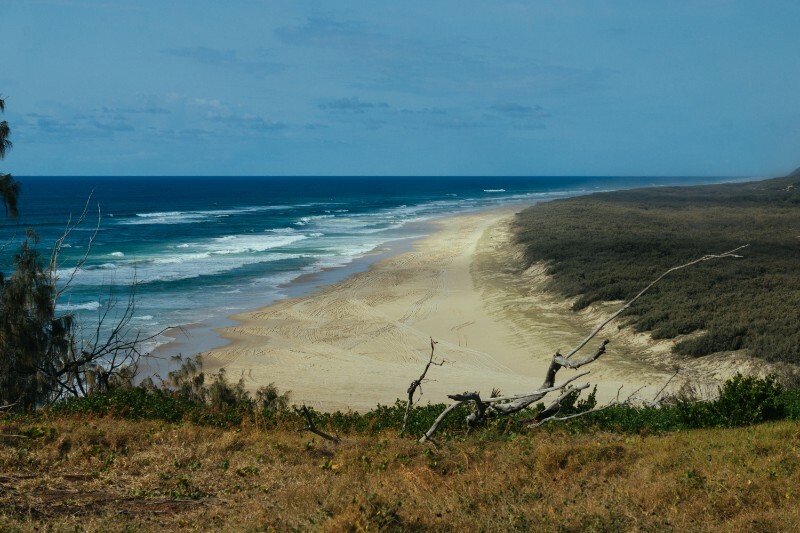 Camping on the beach at Fraser Island is an experience not to be missed so find a camp zone that you like the look of (the further up the beach you go, the less driving you’ll have to do on day two) and set up camp for the night. We stayed at zone 3, it’s about 40 minutes from Eurong and the dunes were pretty low so you get an epic view of the sunrise on day 2. Getting to Zone 3 will take you past Eli Creek and the SS Maheno Shipwreck. There’s plenty of time to see them if you want to stop off along the way but they do crop up in this Fraser Island Itinerary so don’t panic. If you’d rather not camp on the beach, there’s an option to camp at Lake Birrabean, which is included with your camping permit or you could pay extra to stay at Dilli Village. Alternatively, there are non-camping options at Happy Valley; just bear in mind, the further south you are, the longer your drive to get to day 2’s activities will be. Want to camp? Here’s a guide on picking the perfect tent! The overall theme for these 3 days on Fraser Island is early mornings and early nights. It’s not that there isn’t plenty to do on Fraser at night, especially if you’re staying close to one of the villages, it’s just there’s so much to see during the day that a sunrise start really is the best way. Anyway, day two on Fraser Island turned out to be our favourite and it starts with a trip to the Pinnacles. The Pinnacles are another iconic part of Fraser Island. Made up of over 72 different coloured sands, they really shine in the hues of the sunrise and best of all; the tours won’t start arriving until later. If you stay long enough you’ll watch the sands change with the rays of the sun. Indian Head is the most Northern point that most Fraser Island car rental companies will let you go, past here the tracks get a tougher and are recommended for experienced drivers only. That’s ok though because Indian Head offers some amazing views across the Island and really does need a full morning. From the Pinnacles it’s roughly 40 minutes to reach Indian Head, you’ll have to take a short inland track and park at Champagne pools to give you easy access to both after the high tide. From here you can take the short walk to the top of Indian Head, it’ll only take 10 minutes but take plenty of water; it gets hot at the top once the sun rises properly. So why was Indian Head so special for us? Well, it turns out from here you’ll not just see some amazing views, but some amazing wildlife too! White Bellied eagles own the skies while Tiger Sharks bask in the shallows, Manta Ray and Sea Turtles play in the waves and during the migration Humpback Whales come so close to the shore you’ll be able to look down almost directly above them and see the calves playing. Seeing the Tiger Sharks was a big reminder to not go in the sea at Fraser Island, no matter how tempting it looks, so we were really surprised to see people paddling even after the sighting!! Brave or stupid? You decide. After you’ve had your fill of Indian Head (no lies; we stayed there for a good few hours!) it’s probably time to cool off. Champagne Pools are naturally formed volcanic rock pools, almost like a jacuzzi, that makes for a great safe space to have a dip. The aim for almost every tourist who goes to Fraser Island is to see a wild dingo. Fraser Island has the purest population of Dingo in Australia due to how little they interact with domestic dogs, which makes Fraser Island the only place you can see an almost unspoilt Dingo. They hunt mainly at night but if you hang around the beaches long enough, you’re sure to see one try to sneak in an scavenge for some food. We spotted plenty of tracks on 75-mile beach but our first and only sighting of one came while we BBQ’d at the base of Indian Head. If you’re near a fenced in campsite or BBQ spot – use it. It’s probably close to a den. 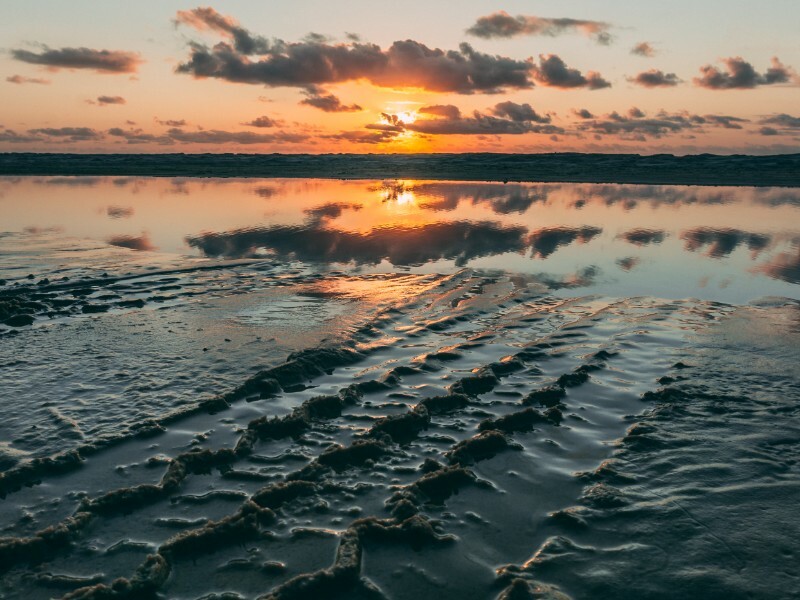 This is an option you could add to your Fraser Island self drive itinerary if you’ve got experience driving on soft sand. We spend so much time at Indian head, that we actually chose to skip this but there should be plenty of time if you do want to do it. The turning for Lake Allom is accessed on the road that leads from the Pinnacles, it’s a tough road so while the distance isn’t far (See Fraser Island map) it will take you longer to drive it. Lake Allom is another perched lake, this one gives you the opportunity to swim with freshwater turtles. There’s a viewing platform here as well as a walking track and campground. Your final day on Fraser Island will most likely be more of a half day if you’re renting a 4X4. We used this day to make the most of the little bits we’d missed out up until now, and also to return back to Lake Birrabean, yep, we loved it that much. 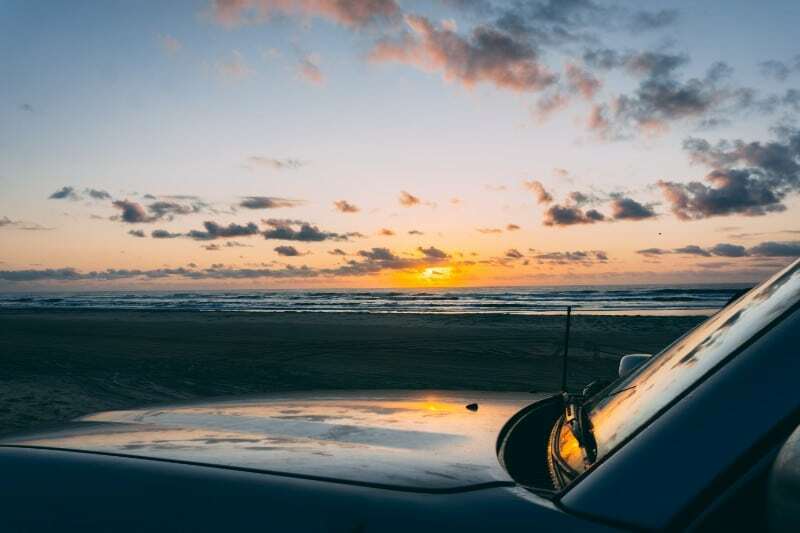 So instead of a planned out day, here are a few little extras you could use to fill your final day on your drive back to the south end of Fraser Island. 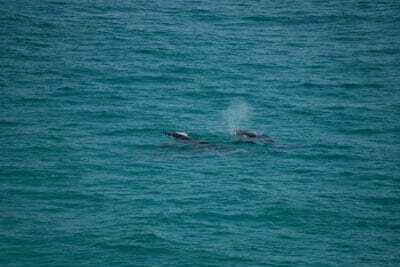 Watch the Whales swim past us in this short clip. Want more? Visit our facebook page! By this point, you’ll have already driven past the shipwreck at peak tourist time. Make the most of day 3 with a trip back at sunrise. As with the Pinnacles, SS Maheno is almost completely tourist free as the sun comes up. The glare from the sunrise really sets off the rusted metal and there’s an almost eerie settled presence around it when there are no tour groups around. Slowly disappearing each year, the SS Maheno was used as a hospital ship during ww2. After the war, she was converted back to a commercial ship and sailed from New Zealand to Sydney often. 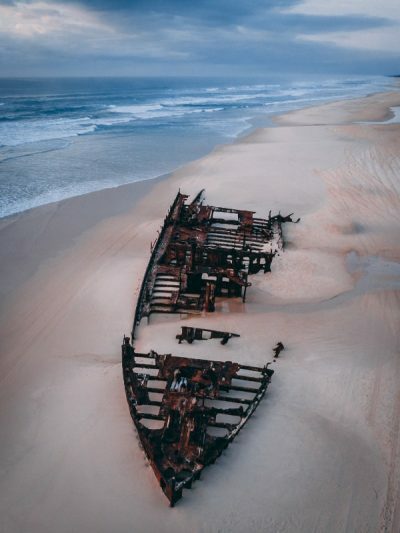 She washed up on Fraser Island in 1935 after a cyclone struck, and she’s been there ever since!! As you probably saw on day 2, during the day SS Maheno is a really popular spot for the tourists on the island so we definitely suggest going at sunrise or sunset, both times we had it completely to ourselves!! 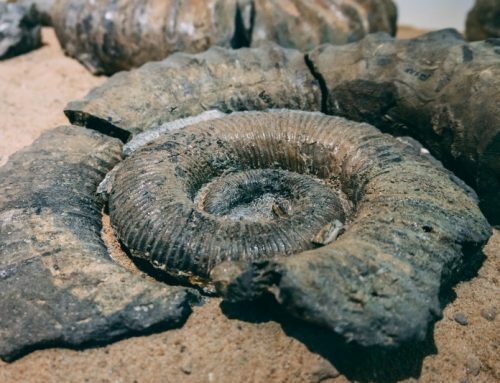 Spend the morning and escape high tide at Central Station where you’ll find a scenic boardwalk over Wanggoolba Creek and some of the worlds oldest species of ferns. It’s a great little spot to escape the heat and learn a bit about the plants and animals on the Island. When you’ve spent all of day 2 on the beaches, being surrounded by Jungle is a refreshing change! Another really popular spot with tourists and a great way to end your final day, Elis Creek is the biggest creek you’ll have to cross on Fraser Island. With over 4MILLION litres of water flowing through it and out into the ocean every HOUR, it’s a title that won’t be beaten any time soon. A great thing to do at Eli Creek is taking an inflatable up the creek and enjoy a relaxing ride back to the beach, taking in the scenery around you. Or simply enjoy a bit of a swim before you head back to the mainland. Don’t swim in the sea. 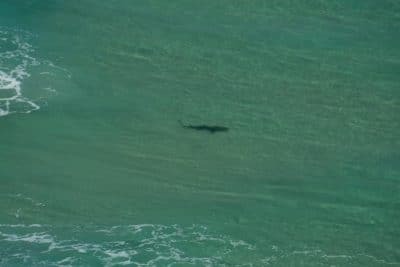 Some Aussies might choose to but honestly, we saw first hand how close to the beach the sharks go – it’s not worth the risk. Fraser Island really is a magical place and doing it in our own 4WD was one of the best decisions we made. However, there’s so much more to see that three days on Fraser Island is just about enough to see the main highlights without rushing around it all so we can’t wait to go back. 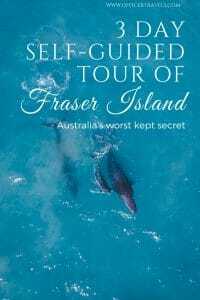 I hope our Fraser Island itinerary has given you some inspiration to make the trip your own and brave it without a tour guide! Have you been before? We’d love to hear your stories! 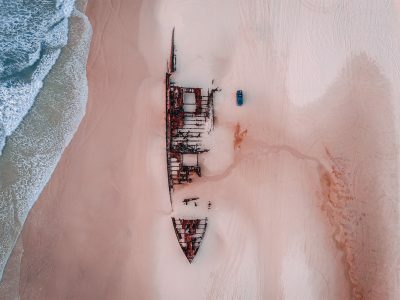 Woah those photos of the SS Maheno wreck are amazing! Sunrise would be such a perfect time to capture photographs there, the beautiful morning glow and of course few tourists. Fraser Island looks stunning! 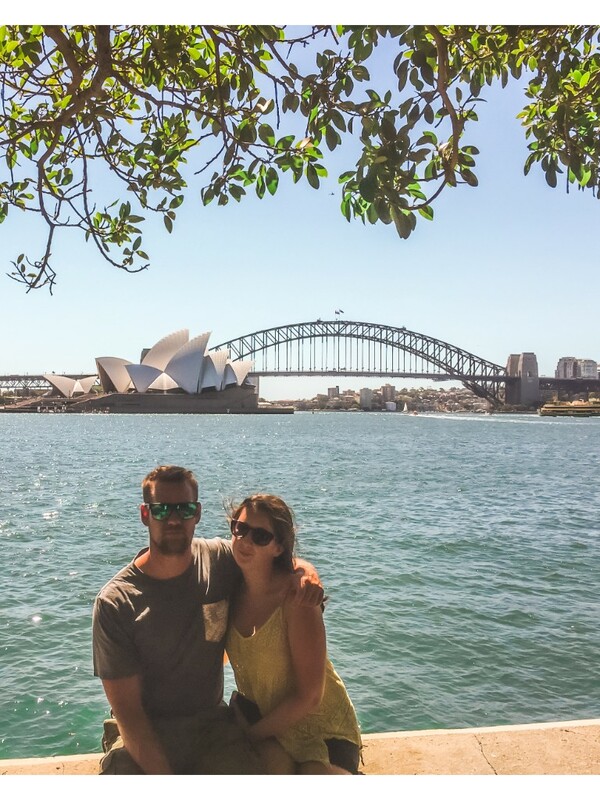 I’ve been to Australia quite a few times but have never made it to this gorgeous spot. A full but beautiful itinerary here. Love the Dingo advice! Thank you! We’re pleased to hear you liked our post! Rainbow Beach is great but nothing compared to the island itself! First off, these photos are STUNNING! I’m not into tours at all so the self drive tour would definitely be up my alley, and I LOVE camping, especially beach camping! Seeing humpback whales in their natural habitat sounds like such an incredible experience (have to admit, I’m a bit jealous!!) and the tea-stained waters sound so incredible! Aww thanks, Erica! I have to say, The humpbacks have been a highlight of our entire East Coast trip! I feel that I’ve just been breathing in all that sea air. What an amazing trip, and definitely one that I’d love to do. I’m a lark, and the thought of seeing all those beautiful spots at sunrise away from crowds is inspiring. (And can I just say how much I’m loving the pictures rising up to meet me from the screen.) You give very sensible and practical tips about the wildlife too; it’s easy to forget there can be trouble in paradise. 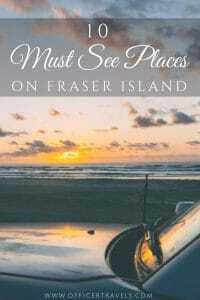 Amazing photos and love the descriptions of the beaches and wildlife viewing spots. Yeah, swimming with tiger sharks … stupid!!! And then, apparently, there are salt water crocs on occasion I have heard in the warmer months? 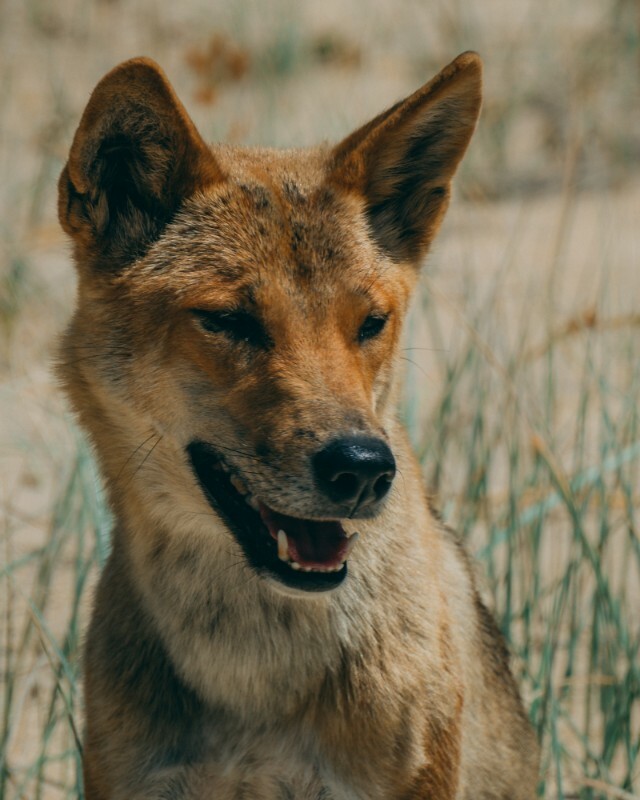 Dingos are cheeky for sure … but also potentially dangerous like any wild animal. Glad to see your warning there. I have got to see Lake Birrabean for myself now too. WOW!!!! Thanks, Michael! I forgot about the Cros! They’re really common on beaches in the far north but from what locals told us, Fraser has only had them on a couple of occasions when they’ve had a lot of rain. I was unprepared for its beauty as well! Wow. How amazing that you experienced Humpback whales out in the wild. Seeing wildlife is always at the root of my travels so this sounds awesome! We’re the same Angela, luckily Australia has plenty of it to find too! I’m fascinated with shipwrecks so am intrigued by the SS Maheno. Your photos are gorgeous and I’m surprised the tourists/buses aren’t there when the light is so pretty like you were (although guessing that’s a timing thing). I find it easier to abide by early to bed, early to rise when camping so beating the crowd would be doable on a self-drive trip like this! Great itinerary, thanks for sharing. I love all your tips and how you sprinkle them throughout the article. I also appreciate going into the details, though there’s something I’d like a few more information on. You said “The prohibited areas on this Fraser Island map will depend on which hire company you go through”. Does this mean that car rental services are given “territories” or they limit your route because they have different passenger/car safety-related rules? Lake Birrabean is beautiful. And to have it all to yourself is awesome! I’d love to see the whales but your advice about how close sharks get to the beach would definitely keep me out of the water! Right! I can’t believe people were still swimming after we told them how close the shark was earlier! Tea Trees that color the water? Very intriguing…The view from Indian Head of the sharks,ray and whales must be something, indeed. We can see why you spent hours there! The dingo smelled the BBQ, huh? Cheeky bugger. Which war was the SS Maheno used in? WWI or WW2? Glad you enjoyed the post, Jerry + Fiona! Yea, the Dingos sure are cheeky! Not sure I’d want to upset one though. It was WW1, it’ll be a shame once the wreckage finally disappears in a few years time.